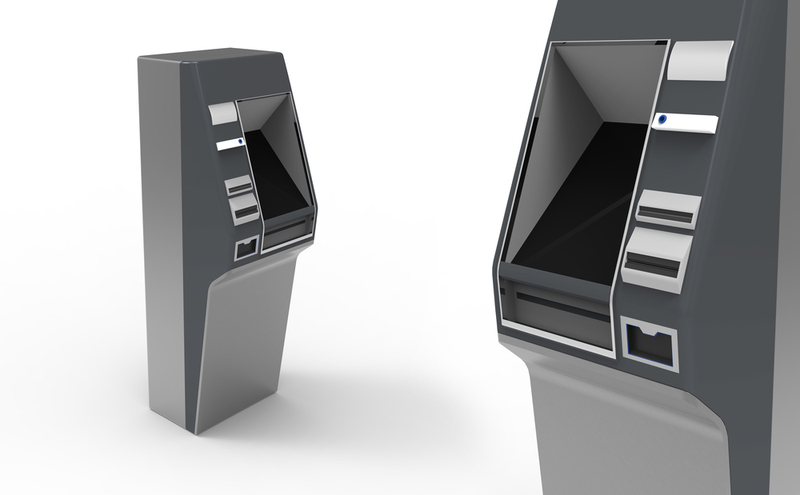 This ATM concept combines human factors research, user experience, and branding analysis to create a handicap accessible ATM designed for high traffic areas. This design embodies LG's aesthetic themes to create a wheelchair and blind-accesible ATM. Intuitive Interaction All "input" interaction is located on the protruding portion of the machine (insert headphones, insert card, insert cash or check) and all "output" interaction is located on the lower front facet, within arms reach (cash out, receipt out). This allows the user's hand placement to flow seamlessly throughout the process. Blind User Interface User research suggests that most modern blind users are unable to read braille; This ATM redesign puts the controls for audio instruction in the most accessible location on the machine, on the front-most portion of the machine, one of the first touch points as any user approaches the machine. Once users read the braille on the top of the machine, they are prompted to insert the headphone jack right below. Blind-Compatible TouchScreen This design eliminates the need for keypad buttons to compensate for blind-compatibility by incorporating braille on top of the touchscreen interface used by sighted users: the braille is embedded in the glass. This offers the blind the same quality of ergonomics, user experience, and privacy as the sighted. Wheelchair-Accessibility The cove in the lower half of the design bases its measurements on human factors research and 2015 ADA regulations for wheelchair accessibility in ATMs. All of the controls located on the machine are within comfortable reach of handicap users and able-bodied users. Diebold's current technology allows for the design to be simple and seamless, grouping all interactions that require "inserting" and "collecting" to create an intuitive flow. The simple, approachable user interface is designed with LG's aesthetic themes from both their hardware and software. The user experience design aims to minimize hands darting back and forth, and identity/information theft. Preliminary Working Model This model helped establish locations of ATM functions, first instant of clear separation of information input and output, and protruding right-hand pillar for blind compatibility. Most decisions are based on user testing, surveys, and human factors data. Full Scale Working Model First model to incorporate LG visual brand language in form with refined input/output locations. This model has real braille text on the surface, printed from Carnegie Library for the Blind, labeling all available functions. The foam core model is accompanied with simulated audio instructions for a user group to test at the Blind & Vision-Impaired Rehabilitation Center in Homstead, PA.
Full Scale Model Full scale allowed further exploration of optimal angles, following ADA guidelines. The model's entire top portion pivots on the rectangular base while the screen itself has adjustable tilt for iterative interactions. The ATM's functions are on removable pieces of foam core for users to compose the dashboard. This model incorporates a tactically obvious headphone jack with printed braille instructions scaled to ADA standards for size. Final Full Scale Model Model most accurate to proportions to final design: accurate heights for wheelchair accessibility, blind accessibility, and comfortable screen/dashboard angles for all users. This model has transparent braille plastic labels instead of white cardstock, closer to the final design of the ATM. The form of this model is a more refined, compact version of the former. High Density Foam Models These scale prototypes are used to model, in further detail, the form of the ATM body. Shown above is a chronological progression from left to right. A full-scale working model (seen above) was tested by the Blind and Vision-Impaired Rehab Center's user group in Homestead, PA. Participants were asked to approach the ATM and figure out how the interaction was supposed to work. Users ranged from those who couldn't read braille, to those who have been reading for years, to those who have never use an ATM before. Some users knew to look for a headphone jack, while others knew to feel around for instructions as to what to do. The blind user testing further solidified the design of the machine; the angles & height were complimented by most participants.